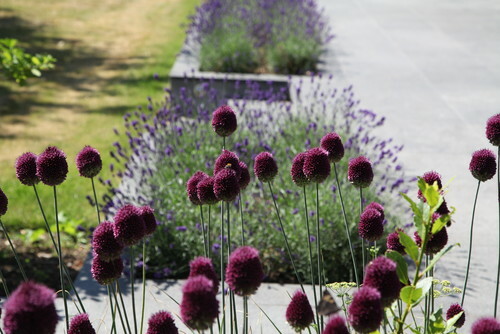 Rosemary Coldstream is a successful, award winning garden designer with many projects to her name. She started her company in 2006 and offers design services from small village courtyards to urban roof top terraces so I had a look at some of her work. Rosemary is based in St Albans and being from round there myself I know that there is plenty of potential to create some fabulous spaces and as you drive round the area you can see some of her touches. 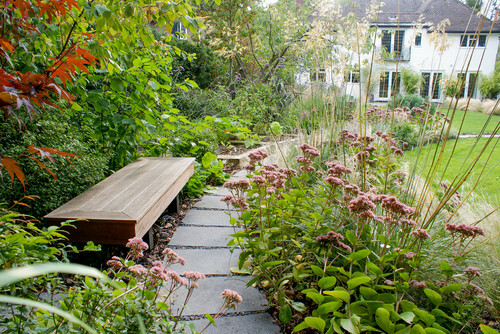 Like many garden designers she serves a wide area around the north of London and Hertfordshire but St Albans and Harpenden are her main stomping ground. 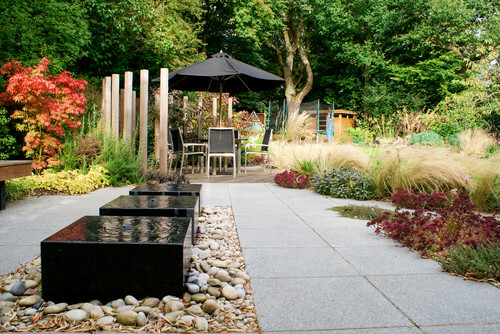 Contemporary garden design is Rosemary’s forte with simple lines reducing the complexity for the eye. This style fits in well with many houses in the area and gives an affluent and stylish feel. 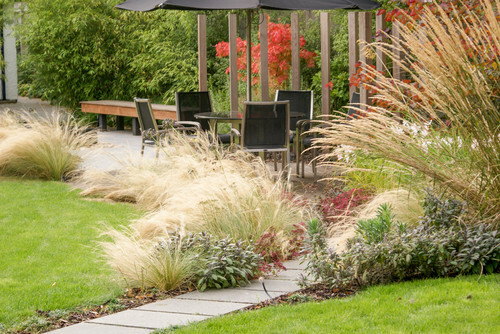 The contemporary style is complemented by lush planting of a mixture of flowers, bushes and ornamental grasses. Looking on Houzz.co.uk it is hard to choose which is best and it is worth looking at them all as they give a good idea of Rosemary’s versatility in design. Whilst her style is contemporary all the designs have a different feel which must be tailored to the customers requirements. My personal favourite is ‘Hertfordshire Modern/Contemporary – LargeFamily Garden’. Looking at the garden there are several sections of the design that are joined by paths that lead the eye and user around the space. 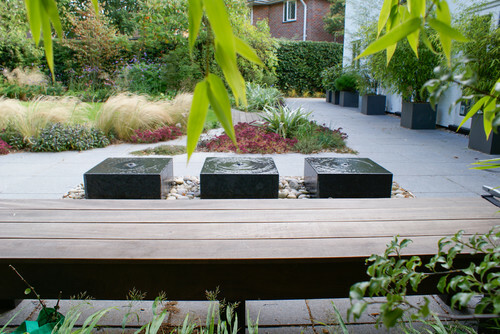 There are design touches built in such as water features and stylish wooden stakes around the seating area. 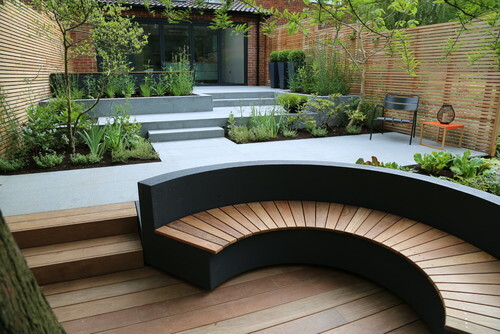 There have been more than one seating and social area incorporated into the design so the client can appreciate the garden from more than one viewing point, a feature that is often used so the sun can be caught at different times of the day. 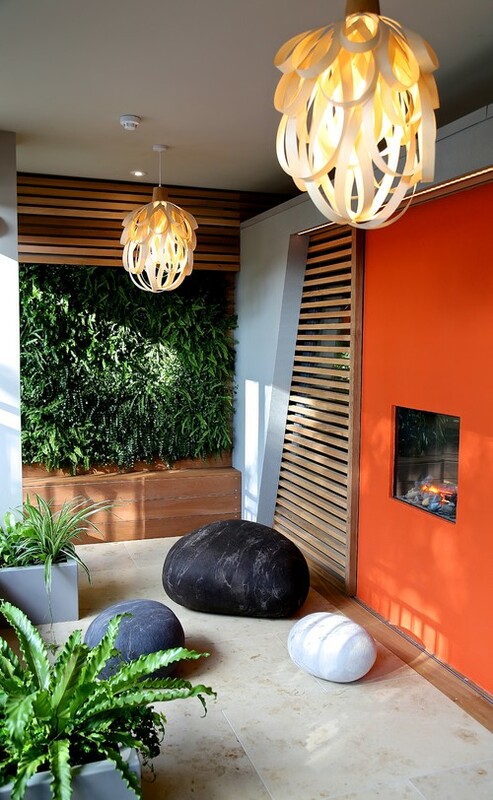 The use of planters and flower pots brings foliage close to the house while maintaining the usability of the hard ground and this raises the plants to a different eye level and thus creates a different experience. Over all a lovely project that uses many attractive features to bring everything together. This was another of my favourites as it is ultra contemporary. 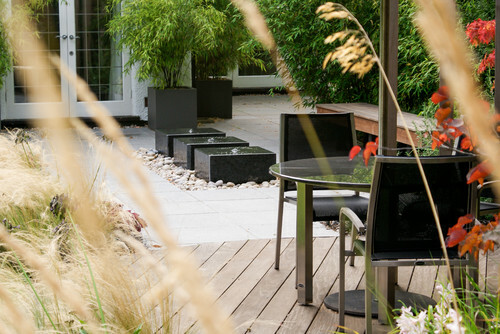 The hard landscaped garden features minimal planting and maintenance for the client whilst it maximises social standing space for outside entertainment. This brings the inside outside more and enables the owners to make more use of their overall space. 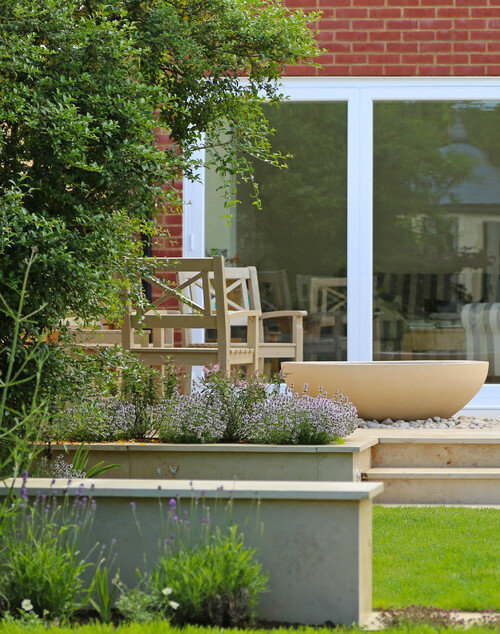 Whilst this garden is not as big as the previous design it features one crucial design feature. 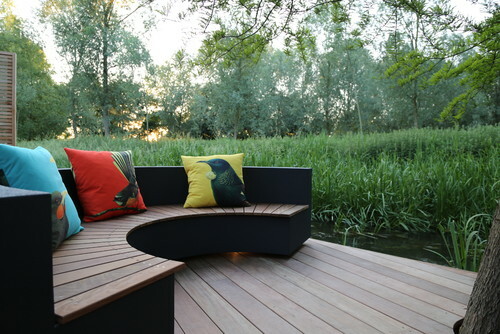 At the bottom of the garden there is a river and on the river has been constructed a round seating area which I can only imagine is just amazing to sit at and while the evening away. Lighting adds a new dimension to the design with it transforming at night. 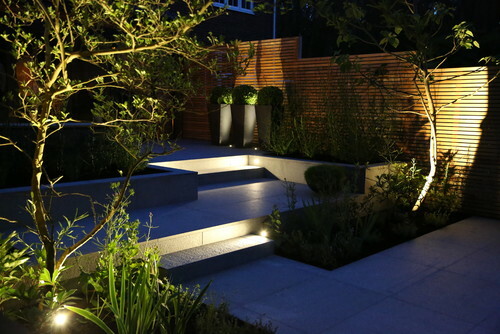 Different sections of the garden are highlighted by spot and up lighters that add class and style to an already highly desirable garden.